A Bible Study Series From the Book of James - Whether new or mature believer, this book will ignite faith and wisdom that bring hope in the new way of living in Christ. James: How Then Should We Live? A Bible Study Series From the Book of James by Matthew A. Knight offers a short Bible study sharing wisdom and insight that offer readers Biblical principles the Church and individuals are to live by. James, nor the author, compromises and the author has written this series to point Christians to what Scripture says and speaks of in conducting church and thus, walking out our Christianity by our deeds. These principles are key to living a “true” Christian walk and inviting the Holy Spirit into congregations and one’s life. With such chapters as: Favoritism, Taming the Tongue, Covetousness: the Cause and Cure, and A Warning to Rich Oppressors, introducing readers by the famous quote, “Faith without Works is dead.” So one might ask, What does that mean? How do I show faith and do good works? Are they both the same thing? Giving Biblical wisdom, the book of James, and the author’s additional explanations go along way to helping one understand that God’s ways are higher than ours. This is a highly recommended read for all Christians, reminding them to go back to the basics and remember why you are different as a Christian, as an ambassador of God, and how the spiritual and the practical come together. This means you not only profess to be a Christian, but follow Christ’s commands in your relations to others around you. Mercy triumphs over judgment and all are called to this holy road. This simple series will impact your life in a powerful way! 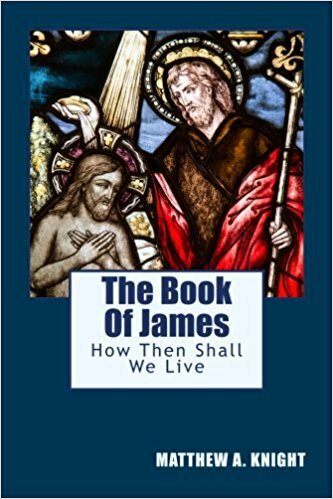 Order your copy of The Book Of James: How Then Shall We Live at Amazon.